In my never-ending quest to be more organized, I make a concerted effort to put things away where they belong or get rid of papers and excess junk before it has a chance to pile up too much around the house. I'm not making any claims that it's remotely helping, mind you. But at least I'm making the effort, right? However, recently I've noticed that my main focus tends to always be on the kitchen (I'm pretty sure the counter is magnetic to clutter) or our living and dining rooms. I'm sure my bedroom would be in less disarray if I actually put away my clothes after washing them... and the bathroom? Well, even when I somewhat manage to straighten my toiletries, I find that my jewelry is spread everywhere. Is it any wonder that I have a hard time finding a particular necklace or pair of earrings when I'm looking for them when everywhere I turn I see pieces spread haphazardly or in random boxes or just plain shoved into a pile or drawer? While I've looked at various jewelry organizers elsewhere online, there always seems to be a reason that I don't end up purchasing one. Not enough storage space, I don't like the style, it's inconvenient or impractical, my husband says its ugly... the list goes on and on. 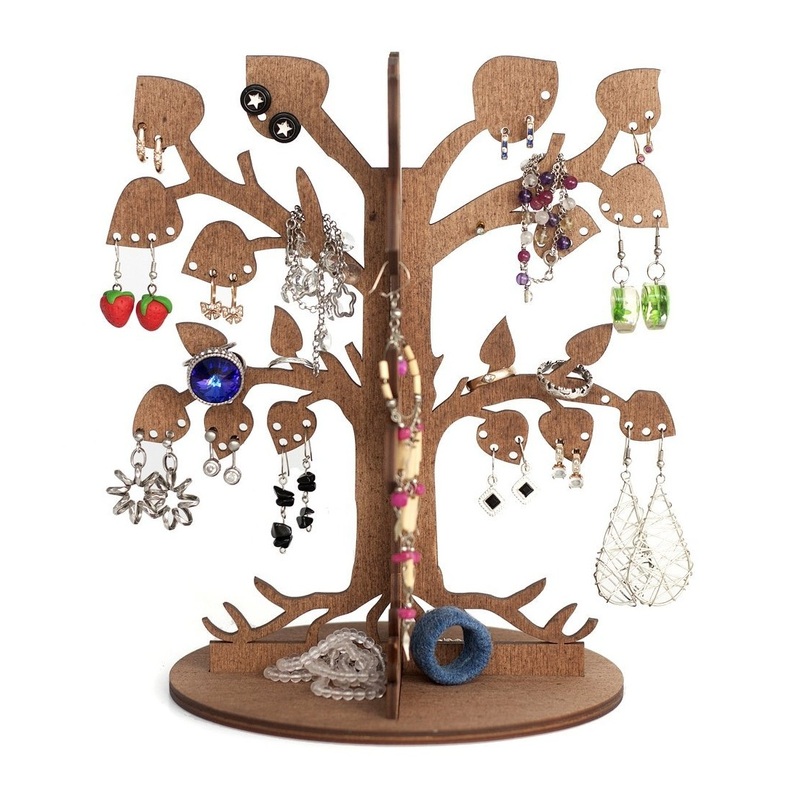 And then I was introduced to Jauku Design and their innovative Leafy Dream jewelry tree and I knew that it was just the right thing to keep my accessories organized, stored and protected in a chic, eco-friendly, fashionable way. Combining the functionality of a jewelry stand with the artistic design of chic home decor, the Leafy Dream jewelry organizer provides space, organization and a unique beauty that is all its own. Forget searching frantically for one earring, gritting your teeth as you try to untangle a knot in a necklace chain or wonder what in the world might have happened to your silver bracelet — the Leafy Dream can keep all of them in order while looking attractive enough that you'll want to keep it sitting out on display on your dresser or vanity! ...I couldn't wait to see how sleek and stylish the Leafy Dream would be in person. As I pulled out the pieces, I was thrilled to see that the natural wood color (also available in brown) was light and smooth, while the plywood construction itself was sturdy and durable. Although Jauku Design had claimed that this jewelry organizer would be easy to assemble, I hadn't realized just how easy they meant! In less than a minute, I had slid the two sides of the tree together, uncovered the sticky bottom, and had placed it squarely and securely into the round base. The unique result stands approximately 9" tall and has 12 branches crafted with perfectly-shaped leaves (containing 102 earring holes) and 12 sticks for rings and other accessories. 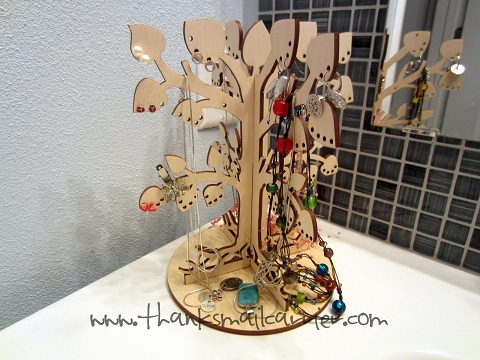 It didn't take long before I was collecting my jewelry from throughout the bathroom and easily hanging it on this tree. I love that each set of earrings (there is room for 52 pairs!) can attach to their own holes, no matter what style or shape backing they have. At the same time, my necklaces can hang from the top tree branches, my rings sit perfectly on the lower sticks and the bottom itself serves as even more storage. The end result is practical and convenient, leaving my accessories accessible, undamaged and all together so that I can find each one with ease. In the time that it has been here, the Leafy Dream jewelry organizer has proven to be efficient, handy, stable and eye-catching in a unique, do-a-double-take kind of way. I love that it is made of natural and ecological materials, it was extremely easy to assemble, and that it has provided me with a convenient space to store all of my jewelry. Typically retailing for $34.95, the Leafy Dream is on sale on Amazon now for $29.95. Whether you need a last-minute gift or have "Get Organized" on your list of ongoing resolutions, this jewelry stand would make a great addition to just about any home. One lucky person will win a Leafy Dream jewelry organizer! 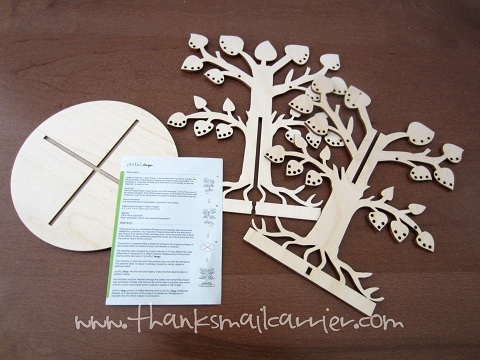 A big thank you to Jauku Design for providing a Leafy Dream for me to review as well as for one lucky giveaway winner. The opinions shared are my own and honest and if you really need to see more, click here to see how I roll. What a neat jewelry holder. It's just what I need for my earrings. I too have them all over my house. It would be nice to have them in one place. I love that it's so easy to put together too. WOW! My dasughter-in-law needs this so bad! It's such a GREAT organizer for all of her jewels. Yhank You. What a beautiful organizer! This would be a wonderful gift for my daughter's birthday coming up. That is a great idea. I have such a tangle in my regular jewelry box that I have to allow time to pull them apart. I like this organizer. I never leave anything out like that b/c I'm thinking it will get dusty. This is a nice one. This is a great idea, but I'd have to put one in the living room too. My sister NEEDS this. Her stuff is all over and this would keep it (mostly) in one place. i love all the designs and they are all excellent. This is so great my mom has a ton of jewelry she would love this. Hum this would make a great future gift idea. What a cute way to organize and display jewelry! Aww, so pretty! This would go so well with my bedroom theme. Love that it is eco-friendly. I do not find this attractive and it looks sloppy. I'm happy that your so pleased with the results but I can tell this is not the product for me. I never can find what I am looking for in my jewelry box. Hopefully, this would simplify my life and reduce frustration. This would help me greatly because my earrings are currently jumbled together in my jewelry box and I have difficulties finding a matching pair. This is so pretty and would look perfect in my room! I am constantly losing my jewelry. lol. I have quite a bit of jewelry and I'm not organized. This would Definately come in handy. I just moved into my own apartment and I have all my jewelry just thrown in a drawer. :( this would be awesome in my room! This would be great for my daughter. I know it would make her take better care of her jewelry and keep it organized. She would wear it more often too. This would really help my daughter organize her jewelry. 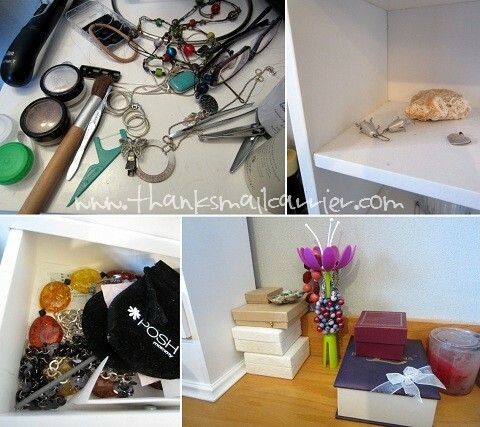 I really need something like this to organize my jewelry. This would be great for my daughter. Currently she has a bunch of push pins in a line across her wall, which she hangs her necklaces from to keep them out of her brothers reach. Thanks so much for the fantastic giveaway! I absolutely love this idea. My bathroom is a complete mess with all my jewelry and no organization to it all. I would love to have this to clean up the clutter! It would definitely come in handy because my jewelry is still in the boxes from when we moved (back in October!) because I have nowhere to put it. I've collected quite a few pieces of jewelry over the last couple of months so this would really come in handy for me since I just keep them in a bowl. I would love this for two Grandgirls I have who now have begun to wear earrings, they got their ears pierced. So far, they have no spot to keep the earrings. This is a pretty way to keep them! Would be great for my mom because she has lots of jewelry. I would love to be able to organize all my necklaces on this. I really need to organize my jewelry. It is either in a plate on my dresser or in little boxes inside a shoe box. To keep earring pairs together! This would be handy to organize my jewelry. My wife desperately needs a new organizer, and this one is attractive on top of being functional. What a unique and pretty organizer! Would look great on my vanity! I have been looking for an organizer for years and just haven't found the right one. This is pretty and functional! This would come in handy for my jewelry, I have been needing one of these lately. My jewelry is in a little container and the necklaces keep getting tangled around the earrings. I'd love to get them organized. hubs and I just had an argument last night about my PILE of jewelry on the counter. This would sure help keep that pile organized! my jewelry is a total mess - this would come in so handy! Currently my jewelry is a tangled mess inside a small jewelry box. Most mornings I don't want to deal with looking for pieces and getting them out so I skip wearing jewelry. This would really help me get everything organized! I have never had a jewelry organizer and I definitely am in need of one. I just through all of it on my dresser or in old boxes and I can never find anything specific when I want to! I would definitely pass this to my sister. She is currently throwing her jewelry into a tangled mess of a box. I would love this because then it would be easier to find my jewelry and I could take them out of the used lunch meat containers. This would be great for me because my jewelry looks like your top photo! Because my jewelry box is crazy messy. i would love this bc i just think its so creative and funky!! What a great way to organize jewelry! I have been looking everywhere for some type of jewelry organizer. This one looks perfect and I love the style! I am a visual person, I like to see my jewelry. This would definitely solve that problem! I'd love one to help my daughter organize her jewelry. I love jewelry, so this would be a great addition to my collection. It would come in handy because my jewelry is so tangled up that I'm too unmotivated to wear it most of the time. My daughter just started liking jewelry and has started a collection. This would be perfect for her to store it all. This is a cute way to keep my jewelry all in one place. This would come in handy for my daughter because currently all of her earrings are piled in a box! This would be extremely handy for me! I have no current organization of my jewelry at all, just piled in a drawer where they get all tangled! Oh, my! I need this! My jewelry is all stuffed into a small jewelry box, and everything is tangled and jumbled up. This would save me time and energy, and it's beautiful! This would come in handy because right now all my earrings are in a little box and not organized at all! This would be great for my sister when she goes off to college in August! She is always losing jewelry because she doesn't have a way to organize it and it's perfect for a college dorm. This would be a wonderful birthday gift for my 13yo daughter! Her jewelry is EVERYWHERE and this would be so cute on her bathroom counter and organized, which would make this momma happy! My jewelry is piled on a shelf in my bathroom, and it falls on the floor and gets lost all the time! This would be a great way to organize my jewelry. My necklaces are always getting tangled. I have a lot of jewlery and no where to put them. I've been looking for a way to hang my earrings. Everything I find is too big. I would give it to one of my 3 adult daughters to hold earrings, because I don't have holes in my ears yet and wear bracelets, rings and necklaces. It looks a bit like the "Tree of Life" and you could drape bracelets and necklaces over the branches. my granddaughter just lays her earrings all over and thenshe has a fit trying to find them, this would be great for her. 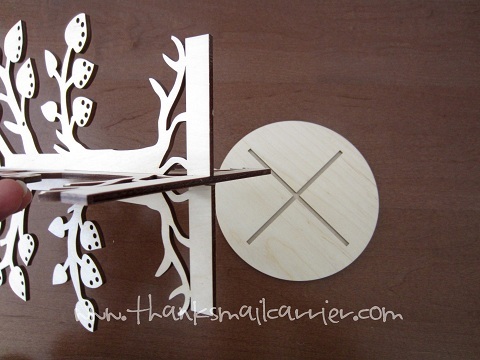 This would come in very handy for my teen to organize all her earrings and other stuff. the Leafy Dream would come in handy for me because I could finally be organized. All of my jewelry would be together. It would be great for my niece because she has a lot of earrings and other jewelry. I would love to give this to my daughter-in-law! I really need this for myself! My daughter Logan is Autistic, and she has this "need" for all of her belongings to be organized... this would be great for her because she would have all of her earrings in one place, easy to see/find, and she can organize them in any way she prefers! It would make a geat gift for my disorganized frien. She is always losing her jewelry. This would be great for the earrings I wear the most! perfect for the earrings I wear all the time! I need this, my jewelry is all over the house! between my daughters and I we have a lot of earrings! I have been wanting a jewellery organizer for such a long time and I am so happy to have found this! My jewellery is in a mess and this is the answer! I would give this to my daughter who currently keeps her jewelry in her top drawer and it gets all tangled. I'm an unorganized person & I just throw my jewelry in the bathroom drawer & have a challenging getting it together in the morning for work. It would be nice to just walk up to the jewelry & pick something out right away, instead of me having to dig stuff out of the bathroom drawer. This would be a present for my mom. All her jewelry is tossed in one box. I am forever untangling necklaces, bracelelets, earrings all looped around rings! I don't have anything to organize jewelry. They just sit on my stand. This would be so awesome to have!!! I really don't have anywhere to hang my necklaces, I have them in a jewelry box drawer right now, this is an awesome looki8ng solution. I would love this...I'm tired of my jewelry getting all tangled up! It would be great to have this when I make jewelry. It would come in handy as I have so much jewelry and I have to admit I keep it everywhere in my bedroom except in one place. This is so pretty! I think it would be a lot easier to keep the pieces I wear frequently on it instead of keeping them hidden in my jewelry box and having to dig through it. I love this and would use it for all my earrings. Which I keep in little boxes. I have the round kind and I find them very difficult to use. This one seems like I can get my hand on both sides easy to clip it on. I have no jewelry organizer. My jewelry is scattered everywhere. I need an organizer. it would be handy for my daughter. she has everything crammed in a ceramic jar with it overflowing and the lid just lying on top of it. I could use this because my jewelry always is a mess after awhile of being used and gets thrown in a box. This would be for my granddaughter who would love this on top of her dresser. My mother would love this as a gift for on her nightstand. Mothers day is coming up! It would come in handy for my wife. She has her jewelry everywhere. This would really help me be able to see my earrings! I love it. How nice! It would be a nice present to give my mom for Mother's Day because she always has earrings scattered on her nightstand. This would keep them organized and together for her. It would be handy for my girls. This would be great for all my necklaces!